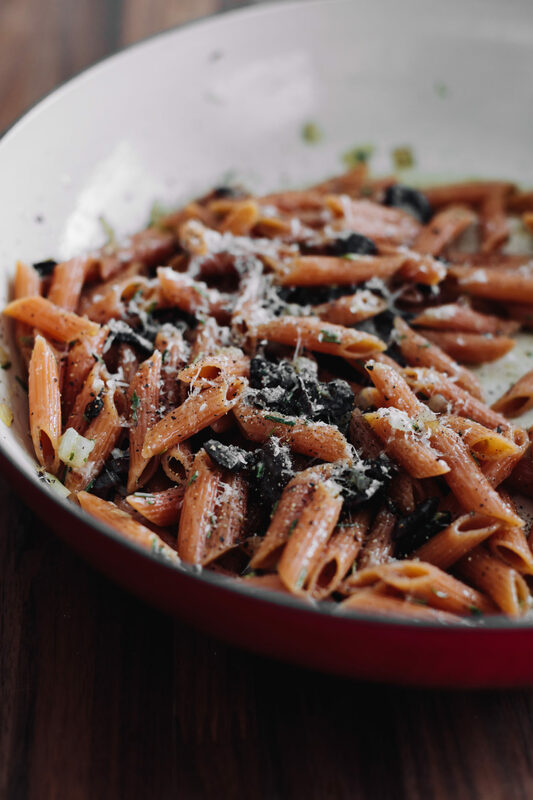 Black Olive Red Lentil Pasta | Naturally. Post sponsored by Barilla. See below for more details. When it comes to vegetarian pasta dishes, it can feel a bit harder to get protein into the meals. I typically opt for making a side salad loaded with chickpeas and occasionally I’ll make a version of lentil Bolognese. However, sometimes I just want a simple, 20-minute dinner that doesn’t take any fuss. 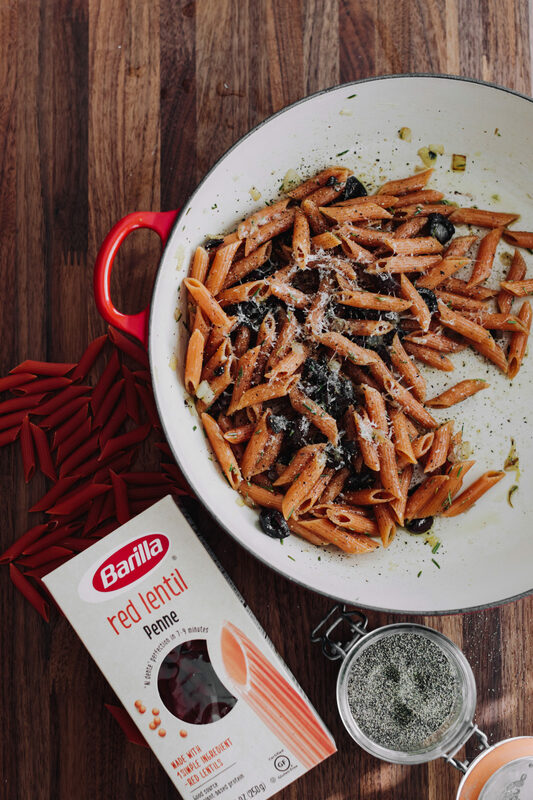 Enter this black olive lentil pasta using at Barilla Red Lentil Penne. I love shallots, but I know they can be a bit of a pain when it comes to mincing. Swap out shallots for minced garlic or minced onion. If you want to make this during the spring, this is also an opportune time to use green garlic. I typically reach for kalamata, primarily because we pick up olives from the olive bar quite frequently. However, using black or green olives would work as well. We keep a couple cans on hand for quick meals, and this would definitely be one of those quick meals! Up to now, I’ve showcased the chickpea pasta from Barilla, but I’m also excited to share their red lentil version. 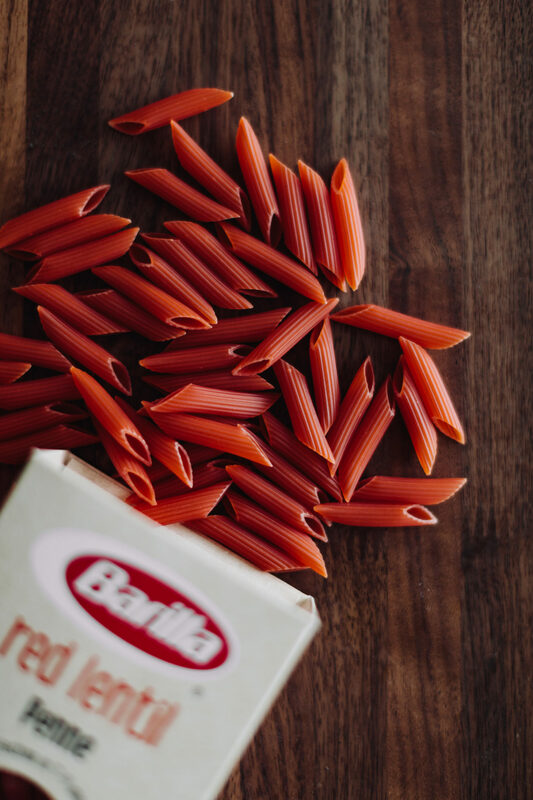 This beautiful pasta is made from just red lentils and one serving has 13g of protein. When cooking vegetarian, it can be a puzzle to get enough protein into your day and I love when I can use ingredients like lentils in unexpected ways. You can find all varieties on Amazon. 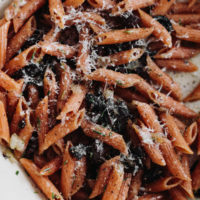 One of the best things about this pasta: it’s easy to make vegan. 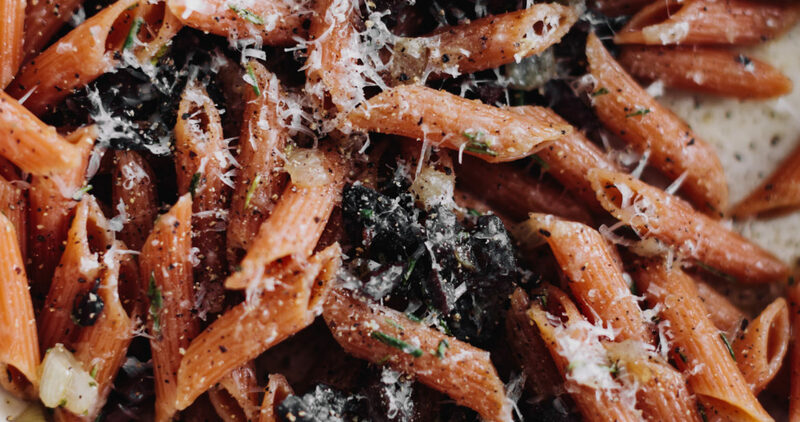 While I love the parmesan in this recipe, you could easily leave it off. Or, try your hand at some vegan parmesan. I love using this mix that has hemp and nutritional yeast- it’s such a great nutty flavor. Cook pasta according to the instruction on the package, making sure to not overcook the pasta. Drain, reserving a ½ cup or so of pasta water, and make the olive oil mixture. Heat a medium pan over medium heat. Add the olive oil, followed by the shallots and a pinch of salt. Cook until the shallots are tender, 6 to 8 minutes. Stir in the olives and cook for another few minutes until the olives are warm. Finally, stir in the rosemary and cooked pasta. Cook for just a minute, to bring everything together. Turn off the heat and add the parmesan. Stir, taste, and adjust the levels of salt/parmesan as desired. 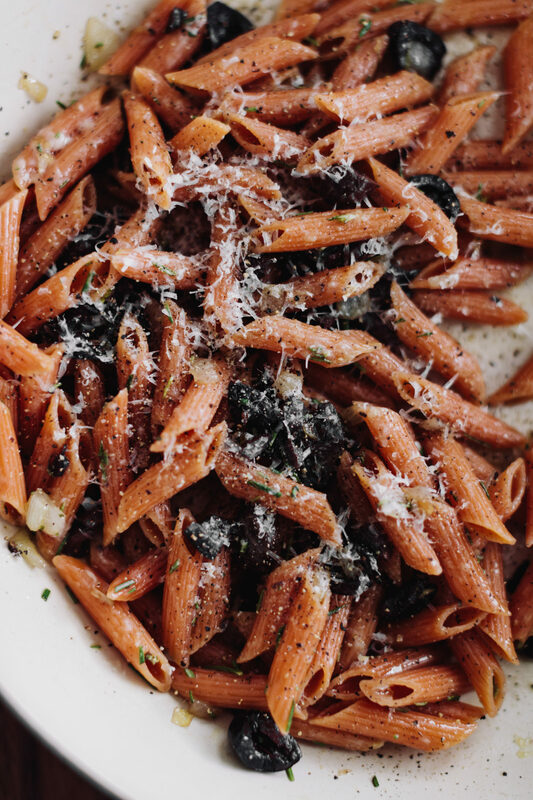 If it’s looking like the olive oil hasn’t coated the pasta, add a splash or two of the reserved pasta water. Disclosure: This recipe was created in partnership with Barilla. All thoughts and opinions are my own. It’s content like this that helps me keep this site running to provide the vegetarian recipes you see every week. Really, quick, simple & tasty! Made it for lunch today. I never leave negative reviews, but this was terrible. It would probably be good if the rosemary were cut in half. I didn’t even use all of what was called for and it was still almost inedible. I feel mean leaving this review, but my goal is to save someone from wasting their time. Make some of her other recipes; they’re wonderful! AHHHHHH! I am so sorry. It’s supposed to be 2 teaspoons. I feel horrible but thank you for leaving the review.